This past weekend was my Mom’s 70th birthday. At this point, getting gifts for my parents has become sort of difficult. They don’t really need anything and they get annoyed if I spend too much money on them. But, for 70, I decided to do something fun for my Mom. One of my favorite artists, Paige Smith, does commissions and her work is amazing. 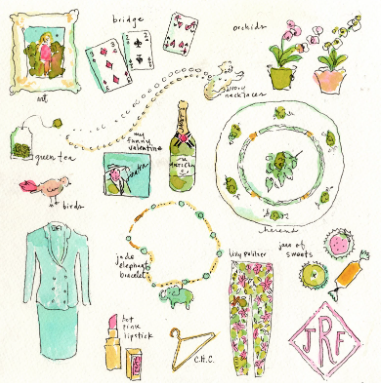 She painted something a long time ago that I loved for her Grandmother, an illustration of all of her favorite things. I decided to do this for my Mom and sent Paige a list of all her favorites. It came out so terrific..
She was so surprised when she opened her gift..I love a good surprise! Now I am thinking I need one for myself. My list of favorite things is kind of long but I am planning on doing a gallery wall in my apartment and keep thinking of things that I can add to my art collection. Check out Paige’s blog here. 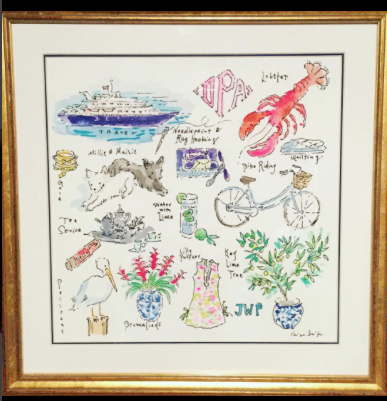 If you are a Lilly Pulitzer aficionado, you will certainly recognize many of her prints. She is an amazing artist.